This is our first cleanup of the Adopt-a-Highway section on PR 57. This is a 2-mile stretch starting at the entrance of Birch Creek State Park on Lake Somerville and ending around CR 162. We will park at the end and work our way back towards the Park. Begin at 10:30 am. The more the merrier! Kids are allowed, but with adult supervision only. Bring gloves and your "Grabber" if you have one. Trash bags and safety vests will be supplied. We will have some water available and we may need someone to drive back and forth between teams to deliver water. Does anyone have good walkie talkies that we could use? RSVPs are necessary so we know how many vests we'll need. When you post that you "Will Attend", please tell us the total number of people in your log. In case of rain, we will postpone the cleanup for one week. Contact Denise (NativTxn) at 979-324-8550 for last minute info. After the cleanup, those who care to are welcome to join us for a picnic at Pavilion #3 in Birch Creek. You will have to stop at the check-in station to pay the entry fee of $3/person (12 and under are free) or bring your State Parks Pass. Please bring enough buns and meat (hamburgers or hot dogs) for the people in your group. Condiments, chips and drinks will be provided. Plus, we'll have door prizes as we normally do with our BVG Get Togethers. Keep an eye on our Facebook Page for more info. 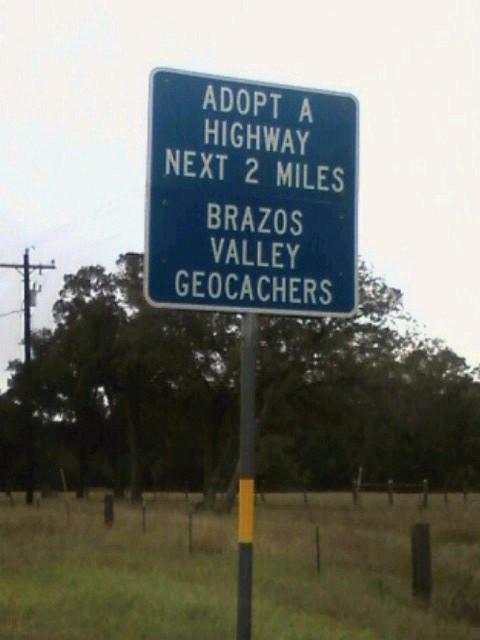 W 96° 39.568' There is a place where TXDOT has rock piles. We can park there. W 96° 37.347' Pavilion #3 is where the picnic will be after the cleanup. Bhe punapr gb tvir onpx gb gur pbzzhavgl! 13 cachers turned out and 21 bags of trash were picked up off Texas highways. I'll be there with Mom (NativTxn) for the trash pick up and the picnic.